Inuk musician/writer Tanya Tagaq's first novel, Split Tooth, tells a magical, fucked-up story about teenage girls' adolescence in the Arctic. In his treatise Why Indigenous Literatures Matter (2018), Daniel Heath Justice (Cherokee) argues that literature is part of a larger struggle across our cultural practices, social formations, and our very selves, to "understand and articulate our humanity." Literature tells stories about people, and indigenous literatures matter because they tell stories about what it means to be indigenous—in a world of one's own people, in a world of settler peoples, in a world with other beings who may or may not be human but are nonetheless people, of a sort. Tanya Tagaq's Split Tooth is what Justice refers to as an "indigenous wonderwork", a term he uses to offer an ontologically indigenous way of thinking about indigenous texts that navigate around, journey through, and refuse to commit to western literary categories such as realism, fantasy, science fiction, and boundary-blurring genres like magical realism, speculative fiction, or imaginative literature. (Justice's chapter on wonderworks was excerpted in a special issue of Apex on indigenous futurisms, available here.) "Wonderwork" draws on a growing body of indigenous scholarship that emphasize the aesthetics and affects of "wonder" as a world-making intervention in things as they appear to be, as they have appeared to be, statically so, since colonization. gestures, imperfectly, to other ways of being in the world, and it reminds us that the way things are is not how they have always been, nor is it how they must be. It's in Indigenous wonderworks that some of the best models of different, better relationship are being realized, and it's these stories that give me hope for a better future even in these scary times. 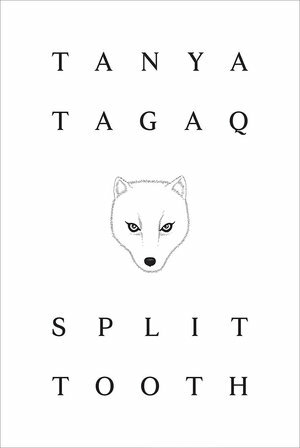 Tagaq's Split Tooth is about modeling and building better relationships—in the narrative, for her nameless protagonist; in our world, for her readers—and it does so through magical, fucked-up, sensual, fun, brutal, and ultimately fateful and liberatory encounters between the teenage Inuk narrator and the spirit beings of the world. To be clear, I write as a settler having been born on land that belonged to indigenous people, and having lived my life on land belonging to who knows how many displaced indigenous groups, clans, tribes, families. I have spent time in my life, before I understood the privileges of whiteness and the racist power dynamics inherent in these actions, fetishizing indigenous cultures, "playing Indian", telling stories of my supposed great-great-great-someone who was an important something-or-other in a well-known tribe. Though I have read deeply into the indigenous literatures of the Americas and received a degree in anthropology that focused on indigenous cultures of the Pacific Northwest, these are not my stories, and so I approach Tagaq's novel as an outsider, distinctly aware of the power dynamic involved in my reading, reviewing, and critiquing it. All I hope is to offer an entry for others, and to advocate for the wonderwork Tagaq is doing. In simplest terms, Split Tooth is a punch to the throat. It's a wild ride that eschews the narrative binds of the literary fiction novel as we typically see it, alternating between poems, short vignettes that read like flash fiction, and lengthier passages that unfold wondrous, spiritual happenings in the vein of magical realism before returning with a snap to the realities of Arctic indigenous life, and meandering back again through literary forms, artistic genres, and modes of being, thinking, experiencing, knowing. Added to this, the Chicanx comics artist Jaime Hernandez has contributed a number of drawings that occupy whole pages, forcing the reader to pause and take a breath of Tagaq's Arctic imaginary (though she unfortunately spells his name wrong in the acknowledgements). Tagaq also includes a poem in Innuinaktun—a dialect of the Inuit language Inuvialuktun—and a syllabary for those who wish to read it, though it keeps its secret from all but Innuinaktun speakers. 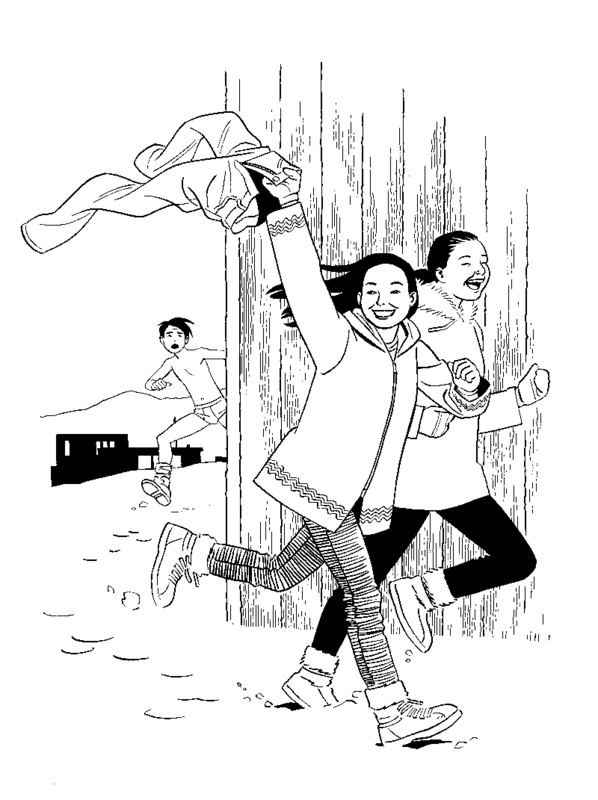 The central narrative is that of a young girl coming up through her teenage years, surviving school and bullies and adults, and eventually becoming a pregnant 17-year-old who gives birth to twins, who then die (or are killed), before the narrator too expires and sinks into the Arctic waters beneath the ice to join her children, her ancestors. Along the way, the narrator tells of immense pains—captured beautifully, uncomfortably, heartbreakingly in the poem "Sternum": The sternum is the shield / Even when impaired / Even when it smothers a little girl's face / As the bedsprings squeak"—and blissful joys, whether in the smile and embrace of Best Boy, a teenager whose love and devotion she knicks from a popular girl at school, or her sexual encounters with Fox and Northern Lights, the latter of whom is father of her children. Wonder abounds and wraps the narrative present (our late '70s/early '70s) in the Inuk people's ancestral past, bringing ancient stories to life. Shot through it all is a refrain Tagaq uses to remind the reader, if not also the narrator, that the Inuk belong to the Arctic and the Arctic to them: "Ice in lung" appears in almost every poem. Split Tooth is a stellar first novel; an incredible work of Canadian, indigenous, and world literatures, though such labels (like the literary novel published by a major trade press) belong to a settler world and colonial legacy that is in many ways anathema, and yet interconnected with, the Arctic world of the Inuk Tagaq helps us to see. Of course, Tagaq (interviewed here at PopMatters) is already a proven talent in the music world, having put out five albums blending traditional Inuk throat singing, folks, and electronica since 2005. Split Tooth is not isolated form this work, but sits in a feedback-loop with Tagaq's music; there are, for examples, significant resonances with her most recent album Retribution (2016), which also heavily features stories about Fox. It's almost possible to conclude from Split Tooth, as a settler reader, that indigenous life is a tragedy. But Tagaq is not so romantic; she recognizes the violence that is the perpetually rising number of missing and murdered indigenous women—in Canada, across the Americas, the world over—as a tragedy, yes, but winds this collective tragedy into the story of a teenage girl who finds bliss, power, self, and her Inuk heritage in the form of communion with the other beings of the world, beings that settler-colonialism banished from indigenous practice and life, replaced with Christianity, with rationalism and science, and forced away by washing out Innuinaktun with English and French in residential schools. It is to the victims of these tragedies that Tagaq dedicates her novel. Split tooth makes clear that there is tragedy in indigenous life. But the gleeful, fantastical, orgasmic adventures of Tagaq's narrator remind us through their great contrasts to the pains of alcohol and sexual abuse in her Arctic community, impoverished by the ravages of settler-colonialism, that to be indigenous is not a tragedy. It is, simply, to be. A part of the Arctic landscape with "Ice in lung", a lover of Fox and the mother of Northern Lights's children, partner of Best Boy; these things coexist with, are even more important than, whatever it is we settler readers might imagine lurking under the supposed "allegory" of the fantasies Tagaq spins, things that seem to be hinted at by the narrator but which are even more muddled than her clear memories of the spirit world, the gods, and the ice.